Today’s guest blogger is Dr. Rachel Laudan. Originally trained as a historian of science, Dr. Laudan has taken her historical research into food history. This blog post is inspired by Dr. Laudan’s most recent work, Cuisine and Empire: Cooking in World History (University of California Press, 2013), focusing on the movers of gastronomic change from pre-history to the present. Dr. Laudan will discuss her work on April 12 at the Food Book Fair at Brooklyn’s Wythe Hotel. The Fair will include two panels presented by the New York Academy of Medicine, Food and Empire and Cookbooks and History. For more information and for tickets, visit foodbookfair.com. “Where’s the beef?” asked actress Clara Peller of a rival burger in a 1984 Wendy’s advertisement. Within a matter of weeks, her words had become an American catchphrase. Curious, though, when you think about it, that Americans were so enamored of beef. Through most of history, beef was low on the hierarchy of meats. Chinese preferred pork or fish; people in the Middle East and the Mediterranean relished lamb and goat; and Indians created cuisines in which meat played a secondary role if not avoided altogether. Most people stayed away from the tough stringy meat from old work animals or worn out dairy cattle. Northwestern Europe and its former colonies are the exceptions. For Americans, for example, not only is beef delicious, but they and others see it as a symbol of American power, particularly when combined with white bread to make a hamburger. On January 31, 1990, 5,000 people waited in the chilly Moscow dawn for the first McDonald’s in the USSR to open its doors; by nightfall, 30,000 had been served. Many commented that the opening of McDonald’s foreshadowed the fall of the USSR. Because McDonald’s was so symptomatic of American strength, no one took it lightly, whether they liked it or not. The Economist used the price of a Big Mac to value the world’s currencies; the sociologist George Ritzer coined the term McDonaldization to mean efficiency, predictability, and mechanization. In the 1980s, the Slow Food movement took its name as it opposed the opening of a McDonald’s in Rome. In 1999, the French farmer José Bové dismantled a McDonald’s under construction in France, rallying supporters with the call McMerde (McShit). 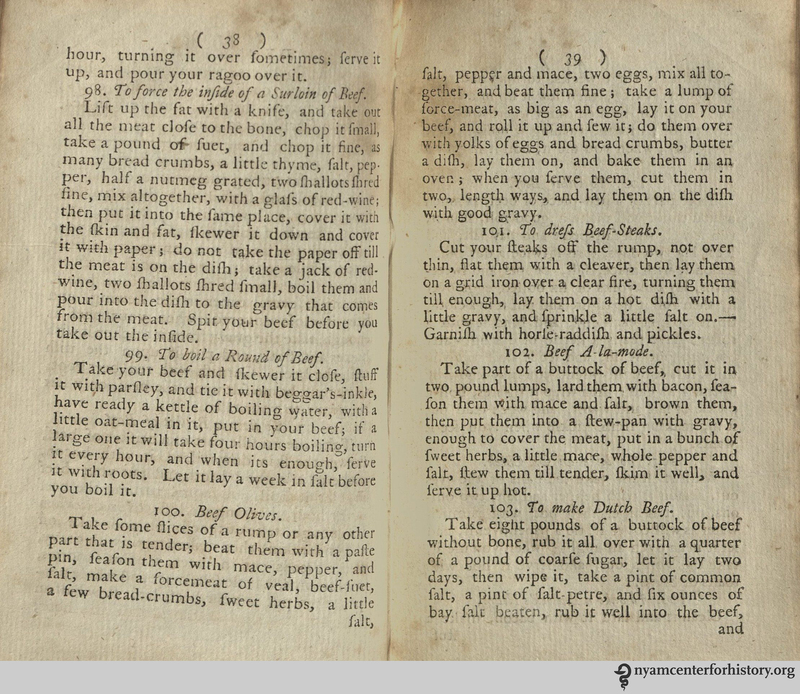 Beef recipes from pages 38-39 of Ann Peckham’s The Complete English Cook, fourth edition, Leeds, 179?. Click to enlarge. Beef as the symbol of American power was a natural successor to beef as the symbol of British power. Beef, the flesh of the most powerful domesticated animal, its bright red color suggesting strength and masculinity, had been hallowed by the English since at least the 17th century. In song, in quips such as the “roast beef of Old England,” in clubs centered around eating steaks, and in ox roasts distributed to the poor on political occasions, beef became synonymous with Englishness. When Justus Liebig, the leading chemist of the first half of the 19th century, declared that proteins were the crucial nutrients, essential to the building and maintenance of the body, English faith in beef was confirmed. In fact, steaks and roasts were beyond the means of most English in the 19th century. Sticky brown essence of beef provided, as hamburger offered later, an affordable alternative. Meat extract, according to Liebig, was as nutritious as beef itself. He offered to provide it neatly bottled from his factory in distant Uruguay, which extracted beef essence from cattle carcasses hitherto valuable only for their fat and hides. 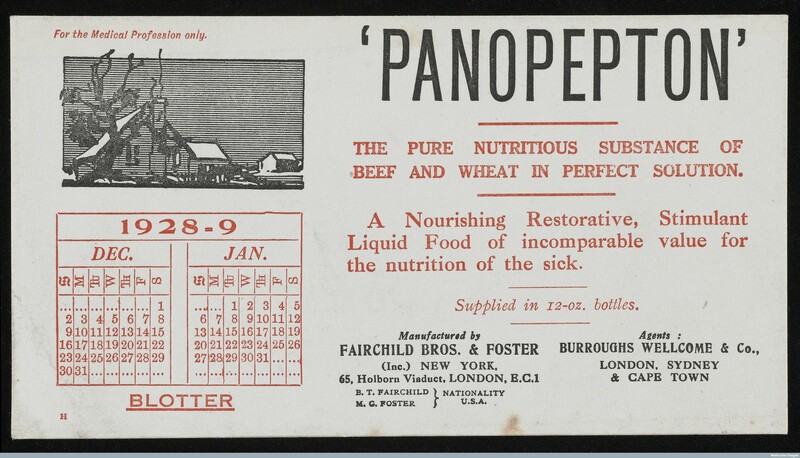 Calendar blotter for December 1928 and January 1929 issued by Fairchild Brothers and Foster and their UK agents, Burroughs, Wellcome and Co. advertising ‘Panopepton’ beef extract, “the pure nutritious substance of beef and wheat in perfect solution”. This would have been one of a series of blotters sent out to members of the medical profession every 2 months. Courtesy of Wellcome Library, London. Beef essence was one of the fastest growing areas of the food-processing industry in the 19th century, with entrepreneurs from the American meat packer Armour to the chef Escoffier investing their reputation and money in extracts. “I hear they want more Bovril. My place is at the front.” 1915 advertisement. Library of Congress, Prints & Photographs Division, WWI Posters. 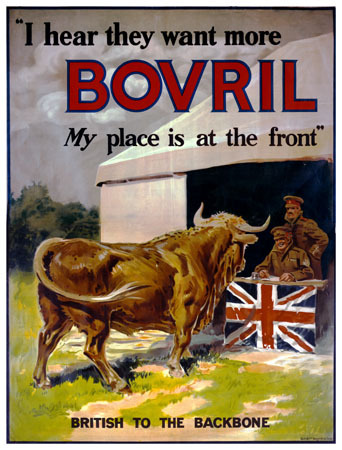 One of the most successful companies was Bovril. Its name combined modern theories of race embodied in the bestselling novel The Coming of the Master Race (1871) by the politician Edward Bulwer Lytton, and classical antecedents of empire. The first provided “Vril,” the name for all-penetrating energy harnessed by a subterranean race of super men, and the second “bovis,” Latin for “of the ox.” According to a series of stunning advertisements, this small jar of brown syrupy stuff strengthened men at the front, built up children bursting with health, and averted influenza, no small matter when the 1918 pandemic killed three to five percent of the world’s population. Meat extract, like hamburgers later, depended on an infrastructure that stretched from the advertising and retailing industries, through the steamships and trains that shipped carcasses to factories and gleaming bottles of extract around the world, to vast areas of land. In 1932, Bovril ran cattle on 1.3 million acres in Argentina and 9 million acres in Canada, over ten times the acreage of the King Ranch in Texas, which claimed to be the biggest in the United States. Inevitably, the power of beef came to be seen as underpinning the expanding British Empire. To mark the coronation of Edward VII, the major British weekly The Illustrated London News ran an advertisement on February 2, 1902. 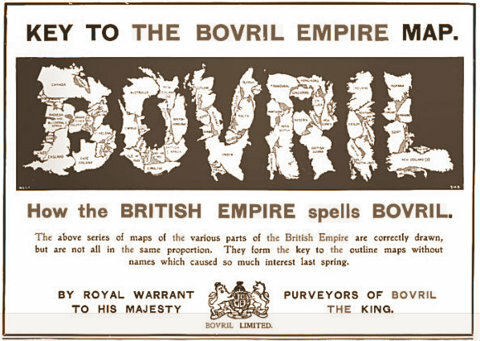 Titled “How the British Empire Spells Bovril,” it illustrated “the close association of this Imperial British Nourishment with the whole of King Edward’s Dominions at Home and Beyond the Seas” by fitting the national outlines (reduced or expanded as necessary) into the letters of the word Bovril. Bovril advertisement in The Illustrated London News, February 2, 1902. Courtesy of Rachel Laudan. Today, although English soccer fans still take hot Bovril broth to games, the idea that it is nourishment for Empire builders is long gone. And even McDonald’s is not the power it was a decade ago. Consumers go instead to Chipotle, Panera, and Starbucks, which offer the promise of healthier, tastier, less mass-market foods. Is this the end of empire? Or a change of direction? This entry was posted in Collections, Events, History of medicine and tagged beef, Beef essence, Bovril, diet, Eating Through Time, food, Food 2015, Food Book Fair, guest post, McDonald's, meat by nyamhistorymed. Bookmark the permalink.